In addition to our patients, thousands of people have passed through the Royal Women's Hospital as staff, board members and benefactors. Some are barely known by name. Others have illustrious and well documented careers. But all have added to the growth of the hospital and the services it provides. Biographies of people associated with the hospital and referred to on this page are presented in the Biographical Compendium, now available as a PDF. 1956, the Board of Management, Medical Superintendent and Manager/Secretary when the hospital celebrated its centenary. In 1856 the 'Lying-in Hospital and Infirmary for Diseases of Women and Children' (now the Royal Women's Hospital) was established under the control of a Ladies’ Committee, or Committee of Management, of twenty members. They were assisted by a Gentlemen’s Committee “for reference and counsel in case of need” (see page 55 of the PDF). 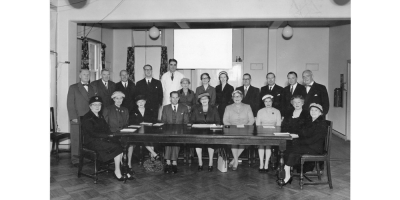 These ladies were hands-on managers, meeting weekly and assuming responsibility for admission of patients, staff appointments and negotiating contracts with builders and suppliers. In an era when women did not pursue careers, these were remarkably competent and professional women. All were married – the first single woman did not join the committee until 1931 – and were supported in their charitable work by affluent husbands. The foundation and management model of the hospital is a classic example of 19th century philanthropy as benevolent middle class women strove to provide aid for their less fortunate sisters. In 1870 the Gentlemen’s and Ladies’ Committees merged, although the Annual Reports continue to list the two groups separately until 1972. Changes in legislation saw the numbers and responsibilities change from time to time. As the hospital grew, staff were increasingly appointed to perform administrative tasks and the Board of Management withdrew from daily affairs to concentrate on the overall performance and strategic direction of the hospital. In 1995, the Victorian Government merged the Royal Women’s Hospital with the Royal Children’s Hospital to form the Women’s and Children’s Health Care Network. The network was renamed Women's and Children's Health in 2000. On 1 July 2004, the Government disaggregated the Women's and Children's Health Care Network and the Royal Women’s Hospital was again established as an independent health service with its own Board of Directors. 1957, nurses' dining room. 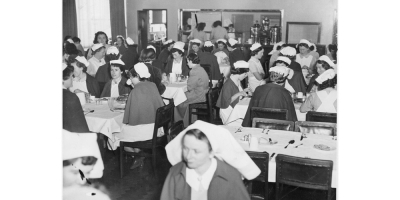 Nursing staff 'lived in' and the dining room was an important part of their routine. Photographer unknown. The Women’s has a remarkable record in the teaching of midwifery, gynaecology and other speciality nursing skills to thousands of trainees, commencing as early as 1859. As the 'Melbourne Lying-in Hospital and Infirmary for Diseases of Women and Children', in the mid-nineteenth century it emulated the education practices of Scottish and Irish women’s hospitals in which training in midwifery and sick nursing was part and parcel of a women's hospital's work. A formal course of three months’ training in midwifery nursing was launched in early 1862 and is thought to have been the first of its kind anywhere in the Australian colonies, with specially produced certificates offered as evidence of training. Gynaecology nursing earned its own training program in 1888 and this remained a hallmark of the Women’s education platform until the early 1990s. Throughout the hospital's existence, training schemes in midwifery and gynaecology have been extended, shortened and re-shaped, to cope with the hospital's exigencies and in response to regulatory requirements. 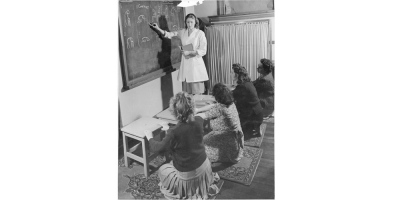 The Women’s became a centre for general nursing training in the 1940s. These student nurses spent much of their time at the hospital’s gynaecology department but gained experience in other aspects of nursing, particularly in the care of men and children, at other Melbourne hospitals. A range of other training courses in the care of women have been conducted or facilitated by the hospital. Some of these include: administering anaesthetics, maternity/mothercraft skills and family planning. The Women’s pioneered neo-natal education in Victoria in the 1970s as advances in the understanding of prematurity made it possible for smaller babies to survive. For most of the hospital’s existence pupil nurses, later known as student nurses and student midwives, formed the backbone of staffing. Pupils had to 'live-in' at the hospital for the duration of their training which, for some, was of two years duration. In the very early days of the hospital, the hospital had a garden where the nurses could sit and take part in recreational activities. A piano was later donated for use in the nurses' quarters. In the early twentieth century, a croquet lawn was laid out and this subsequently became the hospital’s tennis court. 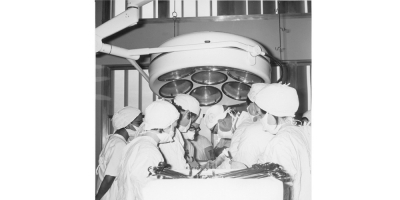 1968, a surgical tam at work in one of the new operating theatres soon after the opening of the 3AW Community Service block. Photographer unknown. As in most public or charity hospitals the senior medical staff at the Women's were unpaid, or honorary. This was a prestigious position which gave private practitioners enhanced standing among both their peers and patients, and importantly, access to a large and mostly submissive patient body - the “enormous clinical material” extolled by Dunbar Hooper. Initially Honoraries were elected by the hospital’s Subscribers, but from 1906 they were appointed by the Committee of Management. Resident Medical Staff, usually young men not long graduated, lived in the hospital and acted under the instruction of the Honoraries. This was a stepping stone in their careers, often to becoming an Honorary some years later. In 1893, during a disastrous depression, the hospital suspended the salaries of its Resident Medical Staff. The first Resident Medical Superintendent was appointed in 1916 and this was a position that assumed increasing control over the direction of the hospital. The early 1970s was a time of social and political upheaval and the new federal Labor government wrought significant change on Australia's health system with the introduction of a national health benefit scheme (Medibank). The implementation of Medibank saw in the end of the honorary system and, since that time, senior medical staff and consultants have been employed in either salaried or paid sessional positions. Prior to this, the only senior positions which were not honorary were the specialist roles of Pathologist, Anaesthetist and Radiologist. However in 1972, in an attempt to recruit general practitioners to the hospital, four sessional Clinical Assistants were appointed to the antenatal clinics. The hospital was founded on the eve of a period of dramatic advances in medical and scientific knowledge. Anaesthesia had only recently been discovered which allowed for the possibility of abdominal surgery. Knowledge of antisepsis followed which in turn eased the risk of infection after surgery and childbirth. As each discovery was made, care for patients became more complex and moved out of the direct control of physicians. Pathologists were required, as were anaesthetists and radiologists. Laboratories were required as well as wards. The early incumbents of these positions were doctors themselves, and in many instances still are, but new scientific specialisations have broadened the range of training and expertise beyond the dreams of the 19th century founders. It was within these scientific roles that the first paid appointments were made to the Senior Staff – pathologists Crawford Mollison in 1913 and Hans Bettinger in 1939, radiologist Colin Macdonald in 1929 and anaesthetist Kevin McCaul in 1951. Modern advances in reproductive biology and genetics, to name but two modern areas of research, have extended even further the need for scientists, technicians and highly sophisticated equipment. 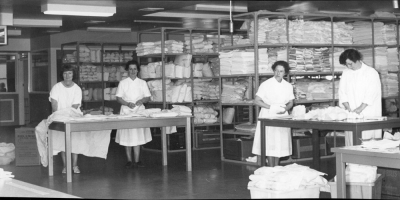 Early 1970s, linen prepared for sterilisation in the Central Supply Department. Previously, nurses performed this work. Like any large organisation, a hospital relies on numerous services vital to its principal function. Administrators, accountants, engineers, porters, cleaners, typists, laundresses, gardeners and cooks are only some of the people who have worked for the Women's during the past 150 years. For many the hospital has been their life, spending thirty, even forty years employed here. It is intended that the online history will record their contributions just as it will the frontline patient care professionals. 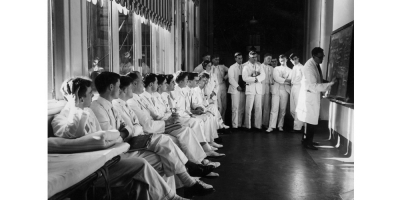 1956, Dr Frank Forster conducts a tutorial for 5th year medical students in the corridor outside the hospital's only labour ward. The Women’s has been a teaching hospital almost from its foundation. In 1862, a medical school opened at the University of Melbourne opened and just two years later Richard Tracy was appointed inaugural lecturer in diseases of women and children. This was the beginning of a continuous association between the two institutions whereby medical students have had the benefit of a large public women’s hospital in close proximity to the university, and the hospital has had the benefit of collaboration in research and advances in clinical practice. The Professorial Unit was established by Professor Sir Lance Townsend after his appointment in 1951. He appointed world-leading researchers, such as James B Brown, to strengthen the hospital’s infertility program and also established research into Rh incompatibility and prematurity. The unit gave rise to major advances in clinical care, including IVF and neonatal intensive care. Collaboration between the university and the hospital has continued for more than 140 years. Initially, the focus of collaborative efforts was to improve medical training, including training that overturned long-held practices found wanting. Increasingly, the collaboration focused on nurse training and on clinical and basic research. Not only did the university have a significant presence on the hospital campus, but the hospital came to have a significant presence on the university campus, particularly through Professors who were also Deans of the Faculty of Medicine. In addition to medical and nursing/midwifery staff, professionals such as physiotherapists, dietitians, interpreters and social workers have long been available to assist patients. The hospital's physiotherapy service has grown from initial appointments of an honorary masseuse in 1905 and an honorary medical electrician in 1932. The first Almoner (social worker) was appointed in 1934 following advice from the then Inspector of Charities. Today, the Women's innovative social model of health recognises factors such as housing, income and stress affect women's ability to care for themselves and their families. 1957, volunteers ran (and still do) a trolley service for patients. Pictured in a midwifery ward in the Genevieve Ward wing. Photographer unknown. Throughout the past 150 years, the Women's has been fortunate to benefit from strong support from volunteers, benefactors and the general community. As an institution founded by benefactors to provide care for under-privileged women, the hospital originally depended largely on the generosity of individuals and organisations. Initially, Subscribers – much like share holders in public companies – provided the operating funds for the hospital and had the right to elect both the Board members and the Honorary Physicians. Subscribers could also recommend patients for treatment. However, Subscriber privileges were eliminated when government funding became the hospital's major source of financial support. Churches, individuals and, increasingly from the early 20th century, auxiliaries worked to provide funds for the hospital. The auxiliaries were a particularly important group from the 1920s onward. Comprised almost entirely of women, although often based in workplaces, the auxiliaries worked assiduously to raise funds by holding social events – card afternoons, balls, fetes – by making saleable items – jams, handicrafts – or by working directly for the hospital by sewing babies clothes or running the trolley service. The 1930s depression was a desperately hard time for the hospital and donations of food stuffs are recorded in detail in the annual reports. Public appeals for the donation of fresh eggs ran for many years. Volunteers also give many hours of their time, assisting staff and patients in functions as diverse as serving in the kiosk to processing archival records. Over the years, there have also been many large bequests from wealthy benefactors and today our world renowned research and the purchase of state-of-the-art equipment are still enriched by support from generous sponsors and donors. In 1956, the Royal Women’s Hospital celebrated its centenary. An international medical conference, a ball and other celebratory events were held and a Book of Remembrance was compiled. In 1953, Dr Colin Macdonald, the hospital’s Clinical Radiologist and Honorary Historian set about researching the lives of the medical staff who had served the hospital in its first 100 years. Volume 1 featured biographies of honorary medical and surgical staff who had died prior to 1956. After Dr Macdonald’s death, several of his colleagues continued to record these biographies in a second volume and some were also published in the Medical Journal of Australia. None have been added since 1975. The two volumes were manually typed, with photographs of most subjects mounted on a facing page and bound in heavy covers. They were displayed for many years in the hospital’s Marshall Allan Library.